Crown Prince Frederik and Crown Princess Mary of Denmark welcomed Crown Prince Naruhito at the Copenhagen Airport on June 15, 2017 in Copenhagen. 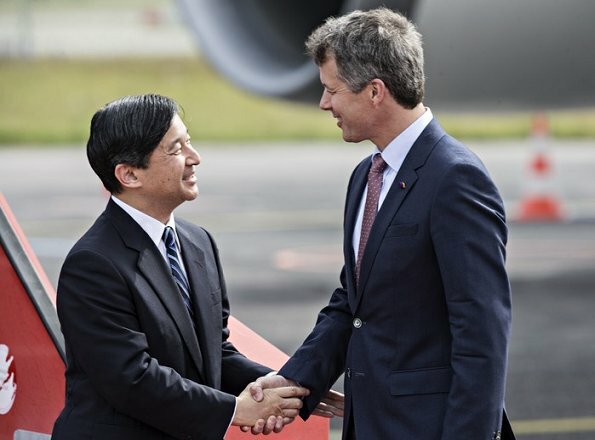 Crown Prince Naruhito is on a official visit to Denmark. What a lovely dress and hair arrangement. Appropriate and professional but also very feminine. I wish a certain British Duchess would take note and rethink her tight short uncomfortable-looking suits. The 'Certain British Duchess' wears many full skirts and floral dresses. She is criticised and people say she should appear more professional. So she wears some fitted, business-like suits. She is criticised again. The poor woman really can't win. Kate is ten years younger than Mary. She may well wear a different style than Mary and find her own. She does by no means have to copy Mary's style, which is always elegant and classy but also a little boring. I agree completely. Kate has worn so many longish full skirts and comes under criticism for it. She can never win. She also gets criticized so often for wearing the same cream coloured heels all the time. I think she varies the colour very often.I find Mary is wearing them a little too often.I wouldn't have worn them with this dress. That being said, I like this dress very much. Pine, this is out of line. Let's not pretend that we haven't noticed many times that Kate wears inappropriately tight jeans. Which doesn't mean she only wears jeans. She has worn frequently very appropriate clothes, but clearly is in some form of transition a day that age where she doesn't want to let go the fact that she isn't 20 anymore. Soon enough she won't be 30-something either, so it's kind of funny to see her yo-yo (used as a verb) her way around the challenges of constant scrutiny. Since this is a post about Mary, I'd say she fared much better than Kate through this period 10 years ago. But then she also was under less incessant attention. We're all human in the end, and will make mistakes. I think Mary overall is mich more comfortable in her own skin than Kate. Should somehow Mary no longer be the future queen, she'd be just fine. It doesn't strike me that she even had the ambition of 'moving up' in society. She could happily go back to Australia and be herself. Which is something that comes across in everything she does. She is who she is, and that is not defined just by her marriage. Big fahion-fail from Mary, oh dear!! A bit "Little House on the Prairie". Something more tailored would have been more appropriate. And the headpiece is strange. Not sure if I totally hate this, but I don't love it, and I don't understand--is the hat on the back of her head actually a fascinator meant for the top or front? Sure wish Princess Masako had made the effort to go with Prince Naruhito to Denmark. I thought she was getting better with her problem. I guess not. A shame. I like Mary's dress. She looks very nice as always. This is indeed a beautiful dress (although I prefer it in the length of the model) but in my opinion not a good choice for a greeting on the airport. A fitted and tailored dress or suit would have looked better. The light chiffon like layered material and the flower head peace looks too much 'summery garden party'. Totally Agree! Besides, I don't think Mary is comfortable with her shoes. I surely am not! One thing that I really appreciate about Mary is that she always looks very comfortable and at ease in her clothes. Maybe a lower heeled shoe, as to not tower over Naruhito. Really, what is with these very high heels that we are seeing on many of the royal ladies? Mary looks lovely as always!